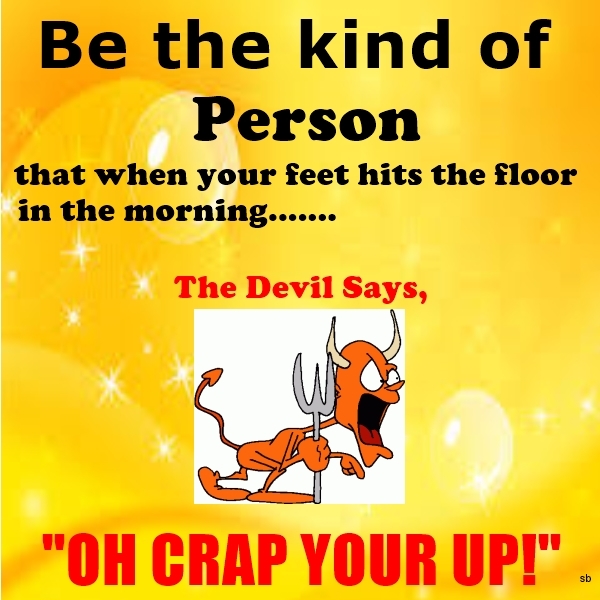 What Makes The Devil Says "Oh Crap"? What Makes The Devil Say "Oh Crap"? When you wake up and your feet hit the floor the first thing you grab is your positive attitude and mood. This causes the Devil to have considerable pain and aggravation. Evil thrives on negativity without hope. These are things that you yourself can change by refusing to give in to them no matter how bad things seem. Hi Sandy :) Thank you I loved writing it, and it always makes me so happy when others like my work. Have a great day. Thank you Terry :) I wish I could I sent you a message. Thank you for sharing. Love this blog, Susan. We need to stop the enemy with the authority we have been given. I will share. Many blessings! Brilliant post Susan. I commented on your blog post and I really like how your blog looks. I wish you all the best. Keep up the excellent writing. Shared via Syndication Automation.